Hair like silk, just smoother. Pantene Pro-V Smooth & Sleek Shampoo works with your hair to silken each hair strand and lock out humidity to help keep frizz from forming. For healthy-looking and silky smooth hair. For best results, use with Pantene Pro-V Smooth & Sleek conditioner and treatment. Fights roughness and controls frizz. Leaves your hair beautifully silky smooth. Leaves hair looking perfectly moisturized. For frizzy, dull hair. 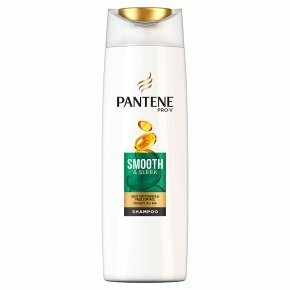 Pantene Pro-V Smooth & Sleek shampoo gently cleanses, while giving hair active Pro-V Nutrients. Provides silky smoothness & frizz control for hair prone to frizz or dryness.